Throughout your first 25 years your blood passed through a particular gland in your body and carried the telomere lengthening enzymes from this organ to all your cells throughout your body. The enzymes in particular that are responsible for telomere lengthening are the size of a large molecule. These enzymes may pass through any barrier so long as that barrier has spacing to permit the passage. A chemical transport mechanism likely already exists. That’s good enough for me! The rest of the Q&A is also a wonderful blend of malarkey and pseudoscience, and recommended reading for anybody who ever took a biology or physiology class at some point in life. Also a great way to depress any 26-year-olds you know. There are a number of other companies with similar products. However, one of the most troubling offerings, in my opinion, is TA-65. This herbally-derived compound was initially discovered at California-based Geron (a respectable biotech company perhaps best known for their ongoing embryonic stem cell clinic trial) during a screen for telomerase activators, and subsequently licensed off to New York-based start-up ‘TA Sciences‘. In fact, TA repeatedly references Geron right on the front page of their website – even though Geron has severed all ties with TA-65 and no longer has anything whatsoever to do with this product. This product has already gotten considerable mileage in the mainstream media, and I’ve routinely seen it discussed on patients’ bulletin boards. TA-65 is derived from Astragalus membranaceus, a species of plant commonly used in Chinese herbal medicine, and although the formulation itself is proprietary (ancient Chinese secret! ), the key ingredient appears to be a molecule known as cycloastragenol (CAG), based on publicly available information and investigations by interested parties. TA claims that their formulation is far purer than the Astragalus-derived extracts one might buy at a health food store (“The product is then sent to a FDA certified, state-of-the-art, laboratory for final purification that ends up with 90+% pure TA-65.”), suggesting that CAG is indeed supposed to be the sole active component of TA-65. 25 mg/kg of TA-65 per day; by comparison, the recommended dose in humans (based on the website) tops out at 4 capsules daily, which is a CONSIDERABLY milder dose totaling 20 mg. On the other hand, those patients who do choose to shoot for the stars can expect to pay an average of $667/month (their estimate) with (of course) no support from insurance. Study subjects experienced lengthened telomeres, restoration of weak immune systems, bone density improvements and other important bio marker improvements which usually decline with age. Anecdotal reports include energy increase, endurance, cognitive improvements, improved vision, sexual enhancement, and an overall feeling of well being. Ah, anecdote – the singular of data. The one published human study was not a randomized controlled trial, but rather an analysis of 114 TA Sciences customers taking TA-65 at different doses, with no placebo group for comparison. Most of the positive findings relate to an even smaller subset of cytomegalovirus-positive patients, in whom treatment is correlated with a statistically significant increase in killer T cells and a reduced overall percentage of short telomeres (although no change was reported in average telomere length). However, there is no comparison against untreated patients, and no attempt to demonstrate that the overall health of these patients is in any meaningful way improved. The authors state that randomized controlled trials are planned, but nothing has been announced to date. 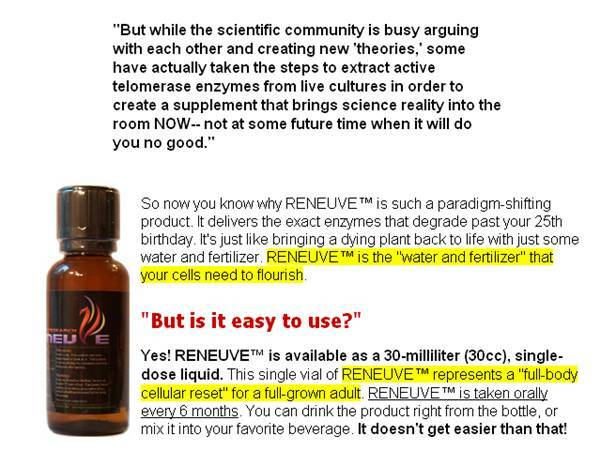 In addition, the website FAQ cites a ‘Pivotal 2005 Anti-Aging Clinical Trial’ “that statistically shows in black and white what real people experienced from TA-65” but provides no link to access that information, and this trial data was never published in a peer-reviewed journal. This isn’t just to pick on TA Sciences – although I am bothered by the number of otherwise reputable biologists who have apparently been pulled into this particular company’s orbit. It’s about how companies latch onto an exciting field and exploit media-perpetuated ignorance. The vast majority of scientists I spoke to for this article were keen to avoid any simple equation of telomere length and “biological age”, especially given the tremendous gaps that still remain in terms of our biological understanding of how telomerase activity is regulated and how telomere function plugs into the larger whole of cellular physiology and survival. On the other hand, snake oil could be better than the alternative of stumbling on something that actually works and having to deal with the unexpected consequences of unregulated, unsupervised consumption. Given that most ‘telomerase-activating compounds’ are treated as nutritional supplements, and therefore covered by the relatively lax standards of the US Dietary Supplement Health and Education Act, only limited safety assessments are required and no formal clinical trial data are necessary, as long as no concrete promises about disease treatment or health are being made.